Former exterminator turned Republican House Majority Leader Tom “The Hammer” DeLay was nailed on multiple charges of scumbaggery. Prosecutors used a novel legal theory never before tried in Texas: They argued that Mr. DeLay and two of his political operatives — John Colyandro and Jim Ellis — had violated the criminal money-laundering law. DeLay remains defiant and pledges to fight on — just as he did in his very-gay debut in Dancing with the Stars. Yep, it was the dog that organized the scheme. Or, the Democrats conspired with aliens because they don’t like his religious beliefs. Or, it is all one big George Soros plot. It appears DeLay will remain a creep to the bitter end, making lame excuses about how he was framed. DeLay has never been one for facts or evidence, so no matter how damning the testimony, the congenital liar will continue down this road. Everyone in Washington had long known DeLay is a sleaze who shakes down corporations and K Street lobbyists, demanding that they support his right wing agenda. Now, the rest of the world will finally see the face of lies, distortions, and corruption behind the phony “Family Values” facade. DeLay likes to say he rules through his fundamentalist “worldview”. Well, I hope his “worldview” from his prison cell is a filthy brick wall. Under Newt Gingrich the new Republican majority in 1994 promised to clean up morals and government corruption with its “Contract With America”. Well, they’ve done a fine job. Newt left the House after an affair with a younger woman. And DeLay may be headed to the hoosegow. The question is, will the Red State suckers continue to vote for a bogus conservative agenda, which is nothing more than a fraud? The Right Wing MO is to talk about morals with southern accents while picking the pockets of Middle Americans. Sixteen years after the “Republican Revolution” working class Americans have no money, and it is clear that the leaders they elected have no morals. The rise and fall of Tom DeLay is a cautionary tale of why placing hopes and dreams in the hands of politicians who say they are on God’s side is dangerous. As for Delay? He’ll do just fine if he ends up in prison. There is always a need for exterminators in those rat infested hell holes. Tom DeLay once said, “America was created by God to spread the Gospel; to spread the word of Jesus Christ and to propagate Christianity.” Well, maybe he can team up with former Watergate felon Chuck Colson and become a poky preacher. Scandal-laden House Majority leader Tom DeLay, R-Texas, slithered out from beneath his slippery stone to lead the congressional charge to undermine his much-beloved states rights and pass an emergency law that switched jurisdiction of the case to the federal courts. DeLay even accused Michael Schiavo and the judges who decided this case of committing “an act of barbarism”. Obviously, this political charade was never about rescuing Terri, but a desperate effort to deflect the stench of scandal from the corpse of corruption that surrounds DeLay, and a cynical effort to resuscitate his comatose moral authority as a conservative leader. Delay was way ahead of most right wingers, smearing Obama as early as Aug. 2008, by calling him a “Marxist” and “socialist” . DeLay also said that legalized abortion is responsible for the immigration problem in America. 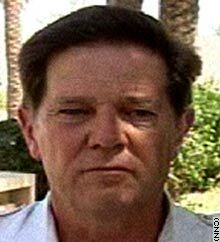 Tom DeLay, a convicted man of convictions. Happy Thanksgiving.